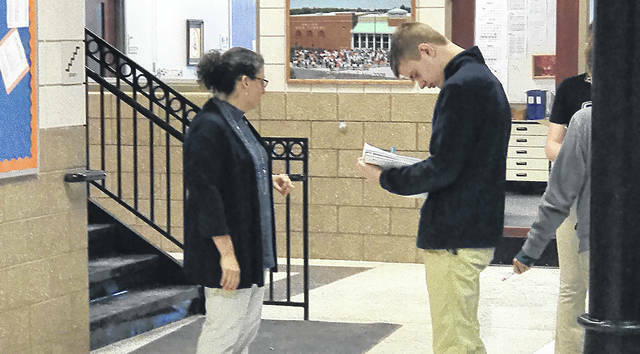 GALION — Amy Tyree, a fourth-year science teacher at Galion High School was ecstatic when administrators approached her about creating a new Environmental Science course for high school students. The goal of the new course is to offer a higher-level physical science option in which students can apply scientific principles and laws learned from previous courses in physical science, biology and chemistry. Students will analyze and interpret data relating to the past, present and future of the planet. “My students know this is a passion for me,” Tyree said. “They have willingly signed up to share part of their senior year with me, exploring our outdoor campus and learning how to live an environmentally sustainable life. Topics of study in the course include Earth’s history, the atmosphere, oceans, ecosystems, agriculture, population dynamics, energy challenges, and climate change. Student-driven, individual research projects coinciding with community service projects are highly encouraged. The “Toilet Tissue Timeline” project was a relative timeline of major geological events in Earth’s history. Students created visual representations of these events and placed them on a 67-foot-long toilet tissue timeline. The “Toilet Tissue Timeline” helped students gain perspective as to how our geological record is interpreted by scientific research. And that understanding of basic principles of geology and scientific methods of research will lay the foundation for future topics being explored during the course. Tyree sees a lot of positives coming out of the new course.